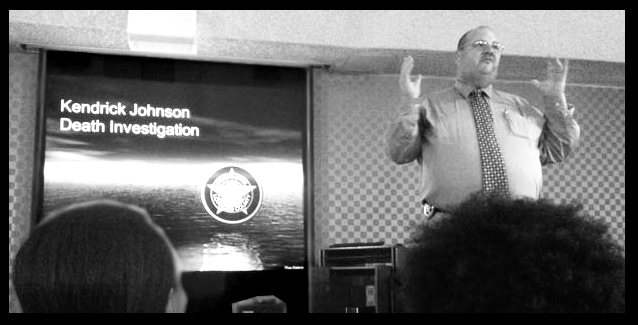 Since the investigation into Kendrick Johnson's death (determined to be an accident), was officially closed, the Johnson family hired attorney Benjamin Crump to help them "get an arrest" for a murder that never happened. Such obstacles have never hindered Crump from an all-out campaign to find someone to vilify and destroy for the purpose of capitalizing on the death of a black child. 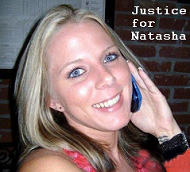 The people he has targeted in this case are two young men and their FBI father. Brian Bell - A high-school student from Valdosta Georgia. Brian played football with Kendrick Johnson until Kendrick, according to reports, was suspended for low grades and poor attendance. Brian and Kendrick were friends at one time. Brian was close to KJ up until about the 6th or 7th grade. It is rumored that Brian and Kendrick grew apart when pressure was put upon Kendrick to join a gang that calls themselves "CVC family", in Valdosta, Georgia. We won't opine as to whether or not Kendrick actually joined the gang, because it's not important. Kendrick didn't die because of his affiliation with a gang, or because he and Brian once scuffled on a school bus. He died a tragic death because, at 17, boys feel invincible, they are tough and agile and they can do anything....even retrieve a pair of shoes from a gym mat in time to make it to their next class. 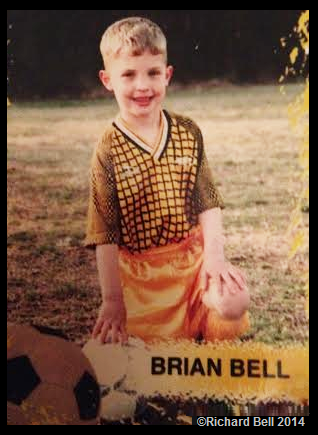 From the time he was a little boy, Brian wanted to play football. Almost a year ago his dream to play college football came true, but the pall cast over this case has robbed him of fully celebrating that dream he worked so hard to achieve. Monsters who believe the Johnson family, and there are always monsters, have called Florida State University to tell them they have recruited a "murderer". Imagine what this feels like to an innocent young person. 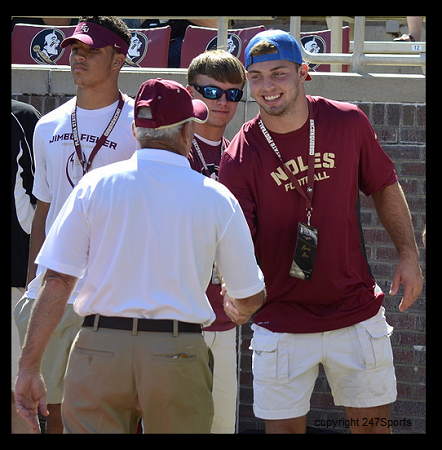 It appears that the Johnson family are not concerned with the harm their selfish accusations might cause Brian Bell, they seem only to care about an arrest, preferably this FBI's son who has been drafted to play ball at Florida State University. The Bells were distressed to hear of KJ"s death, especially Brian, but he had little time to mourn before Kendrick's family started blaming he and his brother for Kendrick's death, even though both boys have alibis that have eliminated the need for them to come before the Grand Jury (not to mention there was no a murder to begin with). Regardless, because of the Johnson family and the power of Benjamin Crump's association with twitter shills and media, Brian's life has been turned upside down. The barrage of accusations have been relentless. Middle aged women stalk him on twitter and copy photos of he and his girlfriend on dates and make fun of them and accuse him of mudering Johnson. It's been almost two years, and to this day, the vilification continues. 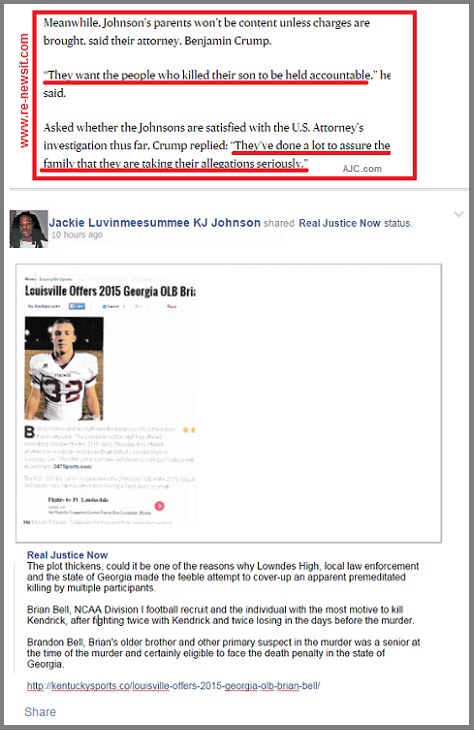 Jackie Johnson focuses mostly on the football aspect when it comes to Brian Bell...she posted the following to her facebook page (text in red box mine). 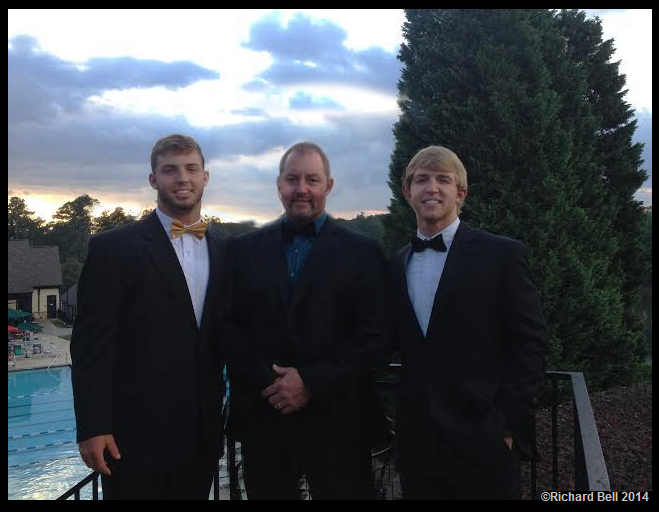 Target letters were sent out to Brian, his brother Branden, and their Dad, Richard Bell, in February 2014. They have never been called to testify before the Grand Jury that was assembled by US Attorney Michael Moore. 100 witnesses have been called, but not once has the Bell family been requested to give their testimony. Michael Moore seems to be bowing to pressure from Crump and the family to get an arrest, "by any means necessary". Moore and Crump will be dealt with, this can't keep happening to innocent people. Branden is not included in this story only because he was not as targeted by the family and social media the way Brian has been. 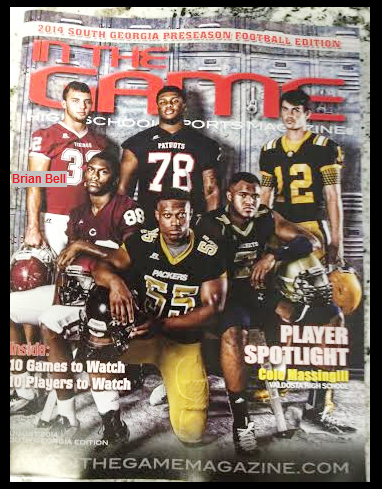 Brian's football career: I find it odd that the target letters just announced on WCTV and AJC.com, went out in February, 2014, the same month Brian Bell committed to play for FSU. I hope people will keep in mind, Brian Bell is not just a name floating around twitter and on court documents, he is an actual young man whose life is being dumped on by no cause of his own. I'd also like to make it clear that I did not speak to Brian or his family while doing this story, 100% my opinion from observing social media. Jackie Johnson, less than one week ago: "No matter what nobody says or what they do, how they try to attack us, we are going to keep pursuing justice for Kendrick no matter what."